Recycle old bowling balls into works of art suitable for garden display. Use paints to create seasonal, themed or whimsical characters out of recycled bowling pins to display in any room of the house. 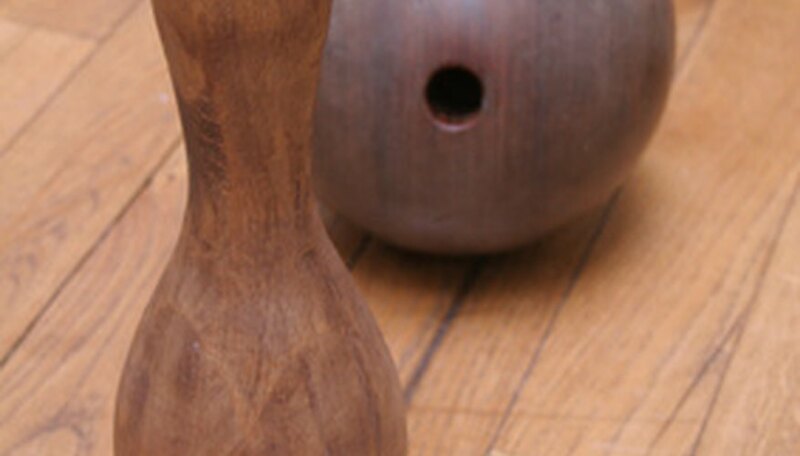 With a few craft supplies and a bit of imagination, you can make bowling pins and balls into functional art. Make a gazing ball out of an old bowling ball to put in your garden or house for an old-world touch of decor. Be sure to sand the ball to prep it for painting to help the paint adhere. Use paint designed to use on plastic. You can try gold, copper, bronze or silver paint colors in a shiny or matte finish. Or, instead of paint, use sanded grout to attach cut pieces of silver or colored mirror to the ball to make a mirrored ball that will catch and reflect the sunlight. Do not forget to clean the grout residue off as you work. Perhaps you may wish to create a creature to put in the garden. Paint the ball to look like a giant frog, ladybug, snail or rabbit. Finish it with polyurethane to protect the painting outdoors. You can create an unusual door stop or bric-a-brac by gluing pieces of colorful broken pottery, china or small bathroom tiles on a bowling ball or pin. Another idea is to glue yarn in striped patterns to cover a bowling pin. Keep each row of yarn pressed tightly against the preceding ones as you cover the ball. If you're interested in science fiction, you can create a steampunk bowling pin by gluing pieces of industrial or mechanical technology to the pin. Cut pieces of aluminum foil and attach them to the bowling pin as the background, or leave it black. Experiment with the look by using items such as bolts, nuts, springs or wires. Be sure to use strong glue that bonds metal to plastic. Use acrylic craft paints to paint characters or people on the bowling pins for indoor displays. Turn a group of bowling pins into a family of people, favorite athletic team members, storybook characters, cartoons or seasonal characters. Ideas include Santa, a leprechaun or pilgrim and native couples to display as seasonal décor. Try using photocopied pictures of family members. Cut out the face and glue it to the top part of the bowling ball. Paint the body in a theme representing each family member’s personality, hobbies or interests. Turn dad into a sports fan dressed in gear from his favorite teams. Make mom a business woman, gardener or supermom with a cape.